Learn how to set up your profile and add a profile photo. Walk thru our slideshow below and the rest of this page for more details. View the recording from the entire session (about 1 hour). Video: It's All About That Base: What's New With the Blackboard Learn Ultra Base Navigation? Ultra Base Navigation creates a more engaging, efficient, and enjoyable experience for both students and instructors. From the moment you log in, you have access to core features in the left-side navigation. You can easily return to the list from wherever you are—even if you're in a course. The list peeks from behind the other layers you have open, including while working in a course (see screen shot below). NOTE: This image also shows there are NO CHANGES to how your courses look. So how does this enhance your efficiency and experience? Modern, intuitive user experience. We believe you are going to enjoy this simple, intuitive, engaging user experience. Works well on mobile devices. This navigation is designed to work well regardless of which device you’re using. Aggregates important information. All your course and organization information – like calendar, messages and grades – is now consolidated into one global view, minimizing the time spent navigating into each individual course. Only one click away. See something that needs your attention? Just click on it and you will be taken directly there, minimizing clicks and saving time. Blackboard Learn Ultra Base Navigation includes a new Activity Stream which displays all the action in all your courses. Regardless of your role in the course, the Activity Stream allows you to see what's due and what needs your attention in your courses (see screen shot below). Items are sorted into Important, Upcoming, Today, and Recent categories. You can jump directly into course activities from the list! Ultra Base Navigation automatically populates the stream with information from all courses in which you are enrolled. You can also customize which notifications you wish to receive in the Activity Stream and by email. For more on Ultra Base Navigation's Activity Stream, watch the following short video. In the new Ultra Base Navigation, you'll always have access to the BASE areas of Blackboard Learn at your fingertips. To learn more about each area, explore the links below. We will continue to use the "Original Course View" for all UNI courses. You may see references to "Ultra Course View" on some of the following pages. Please ignore them as they will not impact your courses next semester. 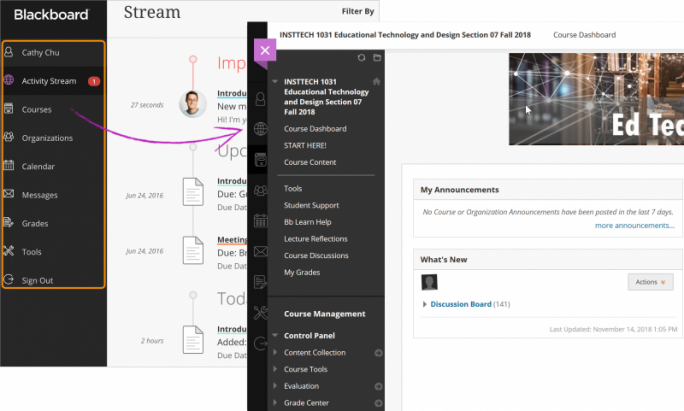 Blackboard Instructor Help: Assistance using the new Ultra Base Navigation from the instructor perspective. Profile: Select your name in the list and make changes to your online persona. Activity Stream: See up-to-the-minute action for all of your courses. Courses: Navigate to past, present, and future courses. Organizations: (New with Ultra Base Navigation) Access the organizations that you lead or to which you are a member. Calendar: View course events and due dates for all your courses. Messages: View and send messages in all of your Ultra courses. Grades: As an instructor, see what needs grading across all your courses. As a student, check your grades for all courses. Tools: Access global functions that are outside of your courses such as portfolios or the Content Collection. Ultra Base Navigation is now here. Login at elearning.uni.edu & experience Ultra Base Navigation for yourself!